And the first update of 2015! Before the following page (16), I am pretty sure this had the most panels that I ever tried to incorporate into a page (save for that one splash and that other fightscene) that had dialogue. There’s 10, no need to go back and count, it’s truish. This page was a big mile marker for me, and something I didn’t want to screw up, even more than my usual ‘how am I going to pull this off‘ panic. It is the first time you (all readers) get to see the boys in Uniform/Schoolyard Attire, besides some of the holiday slates that had the prototype designs in them. This was when Eric and Theo finally have the look that visually defines them for me, for the first book anyway. Having wrote this years ago and let it gather dust, this is one of the key moments I would think about seeing someday. Nothing describes how incredibly satisfying it was to finally show it. For the occasion, I actually took reference photos for the shots of these two pages. Since they were drawn together as one massive project due to magnitude of panel count, since I hadn’t done that I also made a throw back to last time I attempted photo reference here. 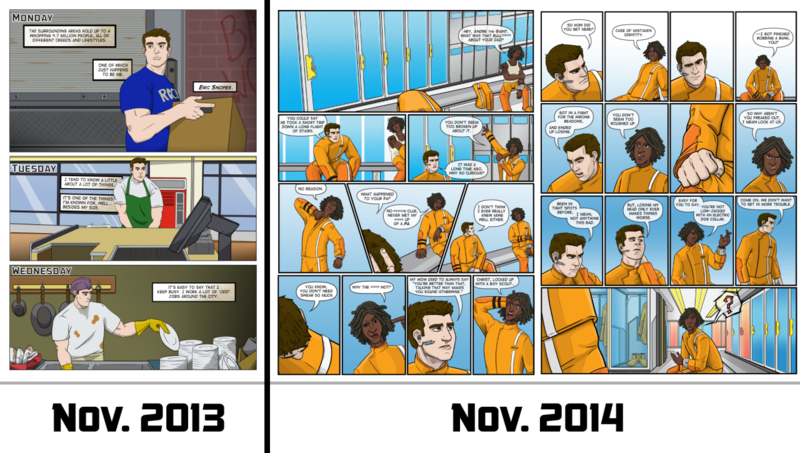 Not only was I showing something I had always wanted to but I also got to see how very far I had come with the comic. First let me just say that I am really appreciating the new readers stopping in, so happy to have you. After the server/host issues I was worried that I would be left in the backwaters of the internet somewhere, you have proved me wrong! This page is part of the pair when drawing 15, you can find more info there as well. This is my first floating head panel page, in the style of Bendis or Kirkman, whom I truly adore as creators. I set out to capture a true moment the first time these two are left alone to be themselves around each other in a larger than life situation and not know what would come next. No introductions, just feeling each other out and they basically started to write themselves for me at this point. Trying to figure out what they were going to do, who this stranger with them was, and what the **** was going on. It was a blast, and the locker room was fun to design to boot. Especially with those hanging uniforms in the background. As I mentioned before, I used photo reference to work a lot of this and the previous page, which helped a lot because this was the most I tried to draw the characters on one page while maintaining their looks. It’s still not flawless but by comparison, it’s come a pretty long way. I couldn’t be happier with the first year of progress. Sidenote: Panel 3 is my favorite shot of Eric thus far, I’m pretty sure anytime Theo says anything there is a 50/50 chance that is his facial reaction to it. I am proud to present a new page! It was the first thing I drew after a long extended winter break (aka burnt out/life is hard sometimes) and it very much was trial and error. I had to learn to draw again, which sounds strange but you actually do get rusty very quickly, and it is endlessly frustrating. And as you can tell totally worth it! The 3rd panel is probably my favorite Theo panel of all time, just nailed him to a T there. Which is the best when you are learning to draw a character again, and then can’t quite capture them the way you want. Lots of sighing and head scratching, the struggle is real. Also! A very special shout out to my very good friend Matt Synowicz, who helped me layout both 17 and 18 when I was struggling to lock them down. We’ve been friends for almost a decade and have worked together on two separate occasions. As someone to look up to art wise, I couldn’t ask for someone better. Click his name for his art blog, it’ll blow you away. If you can dream it, he’s done it, been featured for it, then did it again. Thanks for stopping in, I have been having a mysterious computer issues as of late. It’s making certain programs lag while others just seem to breeze on through, but it means the world to me that you have the patience to keep popping in. I’ll make a blog later today, or tomorrow that shoulder catch you all up on the current going-ons with my end of things. This page was fantastic to draw, I knew that Reaper was going to come out with a bang and just really wanted to show that in your face. It’s the direct approach that Reaper is going to be known for, I hope that came across. It’s a blast (pun kind of intended) to design the weapons and gear that gets to be featured in these pages and I’ve been trying to push myself out of my comfort bubble to make some really interesting stuff. I hope you enjoy it as much as I do! Reaper is going to be sticking around these next few pages, so strap in and let’s see how the boys fare against a physical threat. My reaction is pretty close to Jacobson’s at the idea of them all throwing down in a knock down by your boot heels fight. So this was a long time coming, with the mystery hiatus and this being the page I had to stop mid way through for family reasons. Detailed slightly more Here. A rough summary being that my grandma was sick and there were a lot of trips to my hometown so that I could spend time with her. It’s not a short drive, and with work/life I became overwhelmed. Now that she is in fully recovered (thankfully! ), I found time to begin working on the comic pages in earnest once more. This was a daunting page to come back too. Starting right off with complex panels and high panel count, but it was also really rewarding to tackle. It’s also a big load off my shoulders to finally be finished with it, and I took a good deal of time this week to color and polish enough to be shared. I absolutely love where my style is going and how it makes choices sometimes as if on it’s own, but it does take more time. It seems the faster I get the more I seem locked into the smaller details and it all seems to equal out to overall about the same time span, but it’s a blast seeing where it’s going with each passing page. I hope you enjoy and the next page will be uploaded eventually. I am still sorting through quite a bit of life, so a schedule isn’t expected for some time. Just know I am progressing as quickly as possible, and you are all definitely not forgotten. And despite the sickness, a new page appears! It was a stroke of luck to get this done this quickly with my hectic life schedule, and I am grateful for the help received with it. I was very happy to be working from some older sketches to have a starting point for this pages and it turned out pleasantly. A special shout out to my friend, and frequent contributor to Underdogs. Most recently he has helped with this latest page by fine-tuning the layout and is always a great sounding board for any art that I might not feel is quite right. His opinions are always welcome, and he is an amazing artist in his own right. As for the Comic itself, you can expect the next page to be roughly 2 weeks out, I haven’t had the best life schedule right now and am going to try and prep all of the last 5 pages of Issue 2 at once. This way I can get a jump on my weekly update schedule, especially with how it stands right. I hope you all enjoy and thank you for your continuous support!